Lynda.com is widely known as one of the best online training libraries. It offers tens of thousands of expert-taught top-quality instructional videos on more than 4,000 courses for all skill levels that play on PCs, Macs and a variety of mobile devices 24/7. Starting Semester B 2016/17, the university has entered a license agreement with Lynda.com that allows CityU staff and students to have access to a resource of updated and innovative online training content across academic disciplines to support their professional development and as curriculum resources. Its catalogue of courses covers a variety of topics, including those on computing, animation, accounting, architecture, business, engineering, etc. which are curricula offered in CityU. For the full course listing, please check out the Lynda.com website at http://www.lynda.com/subject/all. As these online courses are broken into bite-size tutorials (each 5-15 minutes long), users can select whichever topic they wish to learn instead of taking the entire course. Lynda.com also provides closed captioning (subtitles) and searchable, time-coded transcripts which make it easy for learners to follow through the content of the entire movie. How can I access Lynda.com? To access your CityU Lynda.com account, click the above link and log in using your CityU EID and Active Directory (AD) password, just like you	are logging into the staff or student LAN. 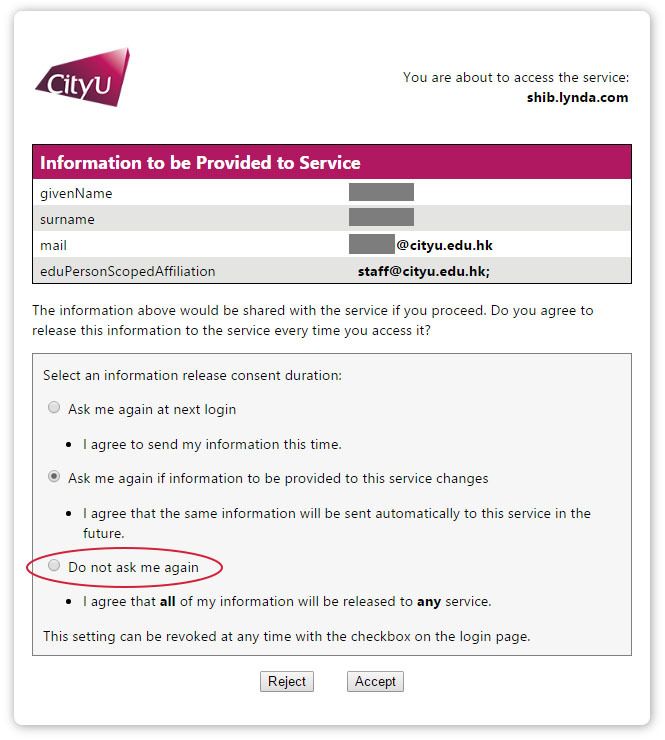 If you do not wish the above information to be prompted every time you log into Lynda.com, you may select Do not ask me again (as circled above) instead. After making your selection, click "Accept" to login. Do let us know whether this learning resource is helpful to you. We welcome all feedback and comments that help us to improve and assess the value of this service. Please send them to lbinf@cityu.edu.hk.